At 11:01am Sunday morning, in 90-degree heat, I crossed the finish line in Central Park and completed my year-long goal of finishing the New York City Triathlon. I was exhausted and frustrated (more on that later), but at that moment, as soon as I stopped running and realized I was done, I was overcome with a profound visceral joy. I’ve been actively training for the triathlon for a little less than a year, but it’s been an idle dream of mine for several years. Since way back in my teenage years I’ve been an sometime runner and cyclist. But last August I did a run/bike duathlon that was more than a little thrilling, and then, in September, I began training as a swimmer, a step that for all intents and purposes was the first step on the road to my first triathlon. For those of you unfamiliar with triathlon (it is conventional to leave out the definite article), it is a race of various lengths consisting of swim, bike, and run stages, in that order. Between each stage, competitors are required to “transition” from the mindset and the equipment from one sport to those of the next sport as fast as they can. Triathlon lengths range from “sprint” distances (approx .5mi/12mi/3mi) to the classic “Ironman” length (2.4mi, 112mi ,26mi). 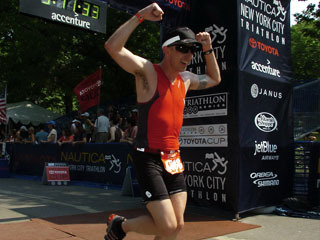 The New York Triathlon is “Olympic distance”: approximately 1-mile swim, 25-mile bike, and 6-mile run. For me this is a sort of fulfillment of a family tradition: My father is a runner and a high-school cross-country team captain, my brother and several aunts and uncles are long distance runners and certified marathoners, my stepfather is a cyclist who biked from coast to coast, my mother swims and bikes, her father (my grandfather) is a living family legend of long-distance running (completing many marathons at an age when most men play shuffleboard), and his wife, my grandmother, has been a competitive diver, swimmer, racewalker… and, yes, a triathlete. My effort was at some level dedicated to and inspired by them all, especially my grandmother. Thank you, family! 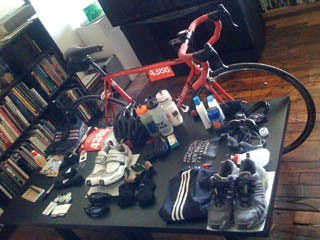 The preparation for any triathlon, especially in the days leading up to the event itself, is elaborate to say the least. I’ve included a photo here of all the stuff I needed to pack for the race, from bike helmet and gloves, three different pairs of shoes, goggles and extra goggles, extra contact lenses, body lubricant (yep), water bottles with water and energy drinks of various sorts, and countless other little things — and this doesn’t even include the full-body wetsuit! 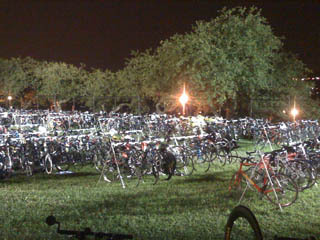 The triathlon is really a weekend-long event, with a check-in and briefing about the race on Friday, dropping off the bike and taking a tour of the transition area on Saturday, and waking up at 2:30am on Sunday to eat breakfast before heading over to the race site. During the week leading up to the event, it was increasingly hard to think about anything else. Every meal was carefully planned, every bedtime strictly enforced. The development of a sore throat Friday morning worried me far more than it normally would have. I don’t think I’ve ever been so conscious of how my body was working. My car service got me to the start area at 4:30. The 3 hours between the time I laid out my gear in front of my bike to the time my age group (men 34-39) jumped in the water went by as if it were only a few minutes. During these twilight hours I was Twittering and uploading photographs to help distract me from the nervousness under the surface (you can check out my live Tweetlog here). Next thing I knew I was in my wetsuit and walking down the gangplank with a hundred other men in their late 30s, listening to a megaphone telling us that we would start in 30 seconds. I got in the water, heard the siren blare, and started swimming. Before this, I had reconned the conditions in the water. The waves didn’t seem bad. The current seemed strong, but I knew it was slowing down. I didn’t see any garbage in the river along our race course, but I did see some nasty looking jellyfish along the shoreline. My summers in Cape Cod have innoculated me against the fear of most varieties of small icky marine wildlife, so I was pretty confident about what would be my first open water long distance swim. Even the initial mayhem of the swim, with arms and legs kicking about like crazy (I was even kicked in the face and almost lost my goggles), I felt like things were under control. But after only a hundred meters, things changed dramatically for me. I was suddenly and precipitously exhausted. I couldn’t hold up the pace I was accustomed to — I’d swam a mile or more in the pool dozens of times before and never tired like this. I was so winded I had to stop swimming and simply drift on my back for a few moments. In fact, this cycle characterized my whole swim — crawl stroke for a few minutes, followed by a few minutes of aimless drifting. The current that the earlier starting athletes enjoyed had by this time come to a standstill, so when I drifted it wasn’t even necessarily in the right direction. In short, things were going pretty badly from the outset. I didn’t figure it out it at the time, but later on, after the race, I realized that the sore throat I’d been wishing away had, moving southwards, matured into an acute bronchitis, constricting my breath as if someone were sitting on my chest. The rest of the triathlon would be shaped by this biological fact, but for me in the heat of competition I could only think to myself “What the hell is wrong with me? Try harder! Breathe harder!” It’s funny how quickly and easily we can blame our problems on our characters instead of our bodies. Somehow, I finished the swim and staggered ashore. I learned later that others were not so fortunate: one man actually died during the swim. It’s unclear how it happened, but I am glad I played it safe and floated gently on my back (with wetsuit buoyancy assistance) whenever I thought anything didn’t feel right. I knew I was falling well short of my target pace, but I didn’t know by how much. 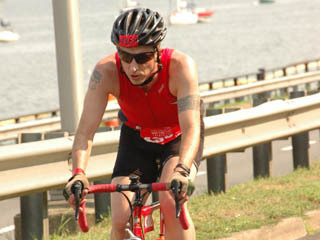 I later learned I completed the swim in almost double the time I targeted, but during the race I simply knew the bike stage was my chance to catch up. Still, I felt faint and winded as I climbed into the saddle. Biking up the Henry Hudson Parkway, however, was a joy. I had fallen so far behind that, as a relatively strong cyclist, I was able to pass a great many people during the 25 miles, and managed to keep a pace very close to my objective, despite my shortness of breath. And cycling on a closed highway, with only a small number of riders around you, is a thrill that’s hard to describe. In the final run, I again found myself in the same condition as I felt in the river: each burst of even low-level exertion would be quickly followed by gasps for air. As with the swim, I again found myself coasting — walking — for a great deal of the running stage. Along the way, there were thousands of spectators and officials cheering the triathletes on. Most of the time I loved the “great jobs” and “doing greats”, but when I was drifting down the river on my back to catch my breath, or gasping for air and walking through Central Park, it was a little frustrating to be urged to a level of achievement I felt I just didn’t have in me. In the big picture, however, the sting of even these bittersweet encouragements kept me focused on the primary objective: to finish the whole thing, to try my hardest, and to never give up. Similarly, the pre-race best-wishes from friends in the real world and via the Internet drove me on. The best part was seeing my family and a few friends staked out along the way. 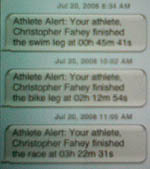 Some were following my performance via a SMS text-messaging service announcing my times as I completed each stage — pretty cool. But the best part was seeing my family with a home-made sign with my name on it. When I finally crossed the finish line, I was surrounded by congratulations from the race staff. I was given a nifty medal, had my photo taken (all along the course, photographers from Brightroom.com took photos of athletes, many of which I’ve included on my Flickr set for the triathlon), and was given an endless supply of branded sports drinks. Knowing that my performance Sunday was impaired by my health, I am totally psyched to do this again, and soon, to see what I can really do. I’m not waiting until next year. I’m looking for the next triathlon now. I’m hooked. 12 Responses to Tri, Tri Again. Good luck and much speed on your next one. Congrats! With or without bronchitis, it doesn’t matter: You are my hero! We’re all proud and some of us are envious. Hello Chris This is your great Aunt Helen in Pittsburgh here to say congratulations! I have always admired the participants in triathalons and wondered where all that stamina comes from. Proud of you for keeping on when your body was not cooperating. Now that you have the bug, we shall expect many more interesting blogs!! Bravo!! Congrats on finishing, and double-congrats for finishing with such a handicap! Hi Chris: Another great aunt heard from! I’m your grandfather’s “youngest” sister and I want to add my best wishes on completing what I always thought to be one of the most difficult sports event ever thought of! It’s got to feel like a terrific accomplishment, especially doing it all when you’re not feeling well. Can’t imagine what you can do when you’re in top form! Congratulations. Great accomplishment — and with bronchitis! Unbelievable. Thanks for sharing your experience with us! I am so proud of you … endurance is the real test in life. I enjoyed reading the blog but I feel your frustration, too! AAARRRGH! You did really good by the way, for being sick and competing in that beastly hot sun. We loved visiting with you and Peggy. I was in the Thursday night swim class w/ you at Berkeley-Carroll and I just wanted to congratulate you on your race. I did it last year as well and I can tell you that the conditions this time around made the race ten times as tough. Congratulations again. @Paul (Grandpa! ), @Helen, and @Mary Lou: I haven’t stopped telling my friends all week about how amazing it is to have my great aunts and my grandfather commenting on my blog! Thanks so much for the nice words and I am so glad to have heard from you! This is why I love the internet. @Mom: Thanks for being there with the big sign! @Josh: Knowing how fast you are in the water, your assessment of the conditions last week makes me feel a hell of a lot better! Dude. You’re in ridiculously good shape. I’m jealous and I hate you. Regardless, congrats!